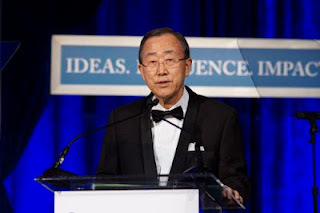 UN Secretary-General Ban Ki-moon is not mincing his words on Syria. Speaking on the eve of a key UN Security Council meeting on Syria later today, Tuesday, Ban slammed Damascus for holding legislative elections “while violence is still ongoing” and hinted that Syrian President Bashar al-Assad will suffer the fate of Laurent Gbabgo, Charles Taylor, or Muammar Qaddafi if his reign of violence continued. Ban’s predecessor, UN-Arab League envoy Kofi Annan, will today update (via video-link) the Security Council on his Syria mediation efforts since his last briefing on April 24. Council members will likely be interested in hearing what Damascus has done to implement its earlier commitments under Annan’s six-point plan. Many Council members are concerned the pre-condition for a sustained cessation of violence—the Syrian government’s halting troop movements and withdrawing heavy weapons from population centers -- has not been fulfilled. He said Annan’s six-point plan and the deployment of UN observers to Syria “is not meant to freeze the situation on the ground, but to create conditions for a genuine, inclusive political process that will address the concerns and democratic aspirations of all Syrians. “We also need a just peace and a political settlement,” Ban said, adding: “The Syrian people deserve their fundamental freedoms, including the rights to assemble peacefully and freely determine their own destiny. They also need immediate humanitarian assistance, which the United Nations is ready to deliver as soon as we get access. “Let me say clearly: this is a difficult mission at a difficult moment. We know the security risks to our brave, exposed, unarmed observers. We know that Syrian citizens could face punishment for talking to the mission. We know the nature of the regime, which could well use the presence of the mission to ready itself to carry out further violence. “But we know, too, that we have to put all our efforts and commitment into this endeavor. The international community, especially countries with influence, must stay united behind this effort. Mr. Annan has done a remarkable job and has my complete support. I call on the Syrian government to uphold its responsibilities under the six-point plan — fully, with no more delays. “The alternative — a full-scale civil war with regional consequences — would be much worse. Those who undermine our mission will bear the responsibility — and will be held accountable by the international community. This is my strong and stern message to the Syrian authorities. Speaking later at the Atlantic Council Awards Dinner, where he received the award for Distinguished International Leadership, Ban alluded to the fate of leaders who lose legitimacy with their own people and the world community. Separately, the United States and France joined the Syrian opposition in pouring scorn on Monday’s legislative election called by the Assad government.